I am a creature of habit. I crave order and routine in most aspects of my life including cooking. It is not very easy for me to try out new things. Thanks to blogging and blog-hopping, this has slowly been changing over the last couple of months, at least where cooking is concerned. 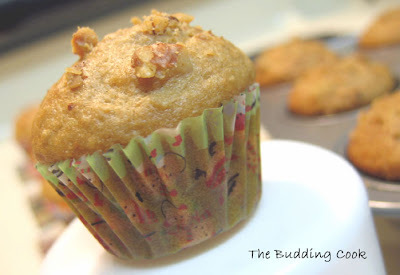 Every time I make a batch of muffins, it is usually always the banana-walnut kind, mainly because I tend to have all required ingredients, especially the bananas- in various stages of the decaying process- on hand. More importantly, it is something that has been tried and tested in my kitchen numerous times. This is how I went about doing it. Mix the dry and wet ingredients together and divide into 2 batches. Preheat the oven to 350 degree F and line the muffin cups with paper liners. Fill muffin cups; sprinkle with topping. Bake for 20-25 minutes or until light golden brown. Muffins can be stored in an airtight container at room temperature for a day or so; needs to be frozen for longer storage. I like how the first batch of muffins turned out. They tasted really good, had a hint of orange-coconut flavor and were not too sweet. The second batch of muffins had no taste in particular and I don't know if I would make this again without making a few changes to the ingredient list. The pomegranate-cranberry juice didn’t detract from the taste, but it didn’t add anything either. It’s raining awards in the food blog world! Helene, Vaishali, Namratha, Laavanya, Priya and Deepa have passed this on to me. Namratha and Saswati give me this one. Deepa also thinks I rock. Thank you girls, for thinking of me and for your sweet and encouraging words! Those muffins look super moist n glazy!Congrats on both your awards, sure its raining awards but you totally deserve both! Each flavour to each award! Great muffins! Nice recipes for muffins. Congratulations on the awards TBC. Well deserved. I still haven't finished the canister of oats I bought more than a year or more ago! I don't think I'll finish it either, because I don't bake and don't want to make another upma with them! The muffins looks so good..
congrads on your awards..muffins are looking great. Banana and Walnuts are classic combo, looks yum! Congrats on double awrds!! Way to go... Wishing you many more awards & happy blogging ahead. The coconut and orange is such a unique combination.. must try it sometime. I liked the sound of cranberry-pomegranate.. sorry to hear it wasn't all that flavorful. Maybe you could add some chopped craisins and walnuts to jazz that one up next time. congrats on the awards dear...you deserve them!! TBC, I've tagged you for a meme. In my latest post. Congrats on the awards! I love your muffin cups! So cute! And the recipes... the pictures are stunning, so I figure the muffins taste as good! I really enjoy muffins and am always on the lookout for new ideas. Your muffins sound wonderful. Pretty pictures too. Sra- upma with oats? maybe I should try that out 'coz I'm getting a little tired of eating the muffins myself since the husband prefers oats with milk. Asha- yeah, that's what I make usually. Just wanted to try something different. Laavanya- the C-P ones were a bit disappointing. I did add walnuts to the batter.I was surprised that there was not even a lemony flavor to it! I too am not fond of oats.Just reaffirms the fact that most things that are good for you don't taste good! I liked the other batch though. ur muffin always look so good! Congrats on the awards, TBC! The muffins are perfect for celebration :). Love the muffin hit parade picture :). Congrats on your deserved awards! Your muffins look pretty good. I made some pomegranate ones, and I felt the same. I would rather have my pomegranate as fruit. Congrats on the awards, too. Muffins luks yummy and it is very nice combo too.. Congrats on your awards.. keep blogging..
Congrats on your awards...GOOD FOR YOU!! The muffins look great. 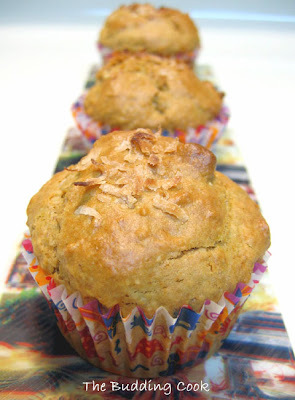 What a coincidence that I also made banana walnut muffins yesterday as well. Thanks for the honest comments on the pom ones...the ingredients look very inviting indeed. May I say you are now a BLOOMING cook as against a BUDDING cook. The blog is beautiful!!! PB...&B- you did! Banana walnut are the ones I make regularly. Vert simple recipe and stunning pictures. I would love that orange flavour in the muffins and am sure the kids would as well. I could substitute orange rind instead of the essence may be? Congrats on the awards! Lovely muffins. Hey TBC, its a late comment but the muffins look too tempting..Congrats on the awards too!! Oh gosh, congrats on all your well deserved awards! These muffins look super delicious! Uma, Swati, W and Miri- thank you! Just bought some oats for the bread! Must try this without the egg. Your pictures are classy - real neat!